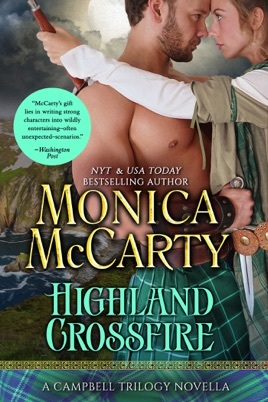 A novella set in the world of New York Times Bestselling Author Monica McCarty's 17th Century Campbell Series. At eighteen, Annie MacGregor thought the worst thing that could happen to her was a broken heart. But she was wrong. Caught in the crossfire of warring clans, Annie’s ravaging at the hands of the hated Campbells has nearly destroyed her. But she is determined to put her life back together, and that life doesn’t include Niall Lamont, the man who broke her heart two years before and has now appointed himself her unwanted avenger and sentinel. Niall made the biggest mistake of his life when he told Annie that he couldn’t marry her. By the time he realizes his mistake, however, it’s too late. His clan is nearly destroyed by the Campbells for harboring her kinsmen, he is outlawed, and the woman he loves has been brutalized. With time running out, and the king’s men closing in, Niall will do whatever he must to earn Annie’s forgiveness—even if it means teaching the stubborn lass to defend herself. But Annie is a MacGregor, and if there is one thing the persecuted clan knows how to do, it is fight. Forgiveness, however, is another matter, and Niall begins to wonder if some wounds just might be too deep to heal.